The first time I visited Croyde Bay in North Devon, I came across a shop called ‘Saltrock’. As soon as I saw it, I knew that I just had to go inside and see what it was all about. Well, I wasn’t dissapointed. 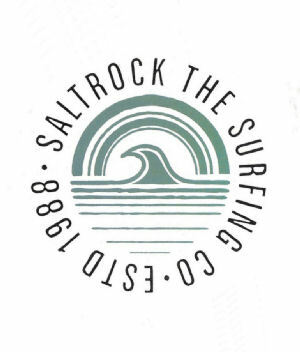 Saltrock* is a British brand based in North Devon designing and selling original and fun surf style clothes. Unfortunatly, I don’t live very close to a Saltrock store, so I was over the moon to learn that they also have a website* which you can order from! So, I decided to treat myself to a few items and let you all know how the experience was. Like I said before, Saltrock is a surfer brand which sells clothes and accessories that are comfortable, stylish and fun! You can kit your whole family out with this brand as they sell things for men, women and kids. If you love nothing better than being active or lounging around in your favourite comfy hoodie, then this is the shop for you. Is Saltrock Clothing Good Quality? Over the years I have bought several things from Saltrock and I can honestly say that I have never been dissapointed with the quality of the items that I have bought. The hoodies are always made from very soft and comfortable fabric, they look and feel like quality clothes. I think that when people wear relaxed and comfortable clothes there is always an element of feeling a bit underdressed, but this is not how I feel when I wear my Saltrock clothes. I think that this boils down to the quality of the brand. Shopping online can either be pure joy or a nightmare. My experience of shopping online with Saltrock is definitely not the latter. The website is easy to negotiate and the delivery terms are standard, costing £3.95 and being sent via Royal Mail with free shipping for orders over £30. If you are not happy with your items then the you do have to pay to return the items yourself but as you can probably tell by my positive review, as of yet I haven’t had to return anything back to Saltrock. So, as you can already tell I am a happy and loyal Saltrock customer! I would definitely recommend this brand to anyone that loves the relaxed and fun surfer style. If you are ever in North Devon then be sure to look out for one of their stores. If you can’t wait till then, then why not check out their website www.saltrock.co.uk*. I have been shopping at saltrock in swindon wilts for 3 years now. They have the best sale prices ever good quality compared to primark. Would thoroughly reccomend shopping here. I totally agree, their sales are amazing! I do most of my shopping from them online at the moment but I have just found a little shop in Howarth that sells Saltrock clothes so I’m really chuffed!